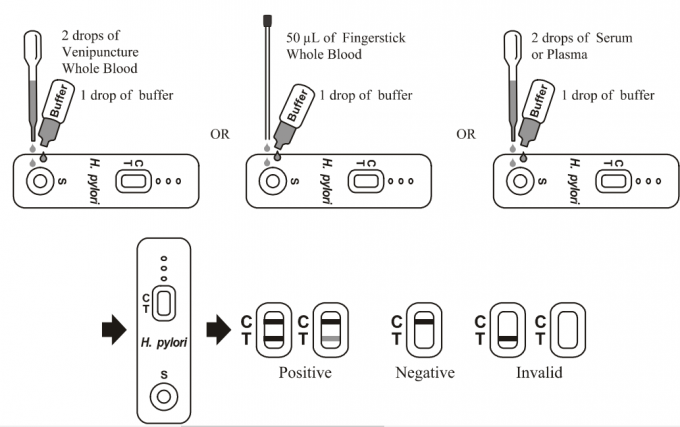 The H. pylori Rapid Test Device (Whole Blood/Serum/Plasma) is a rapid chromatographic immunoassay for the qualitative detection of antibodies to H. pylori in whole blood. H. pylori is a small, spiral-shaped bacterium that lives in the surface of the stomach and duodenum. It is implicated in the etiology of a variety of gastrointestinal diseases, including duodenal and gastric ulcer, non-ulcer dyspepsia and active and chronic gastritis. Both invasive and non-invasive methods are used to diagnose H. pylori infection in patients with symptoms of gastrointestinal disease. Specimendependent and costly invasive diagnostic methods include gastric or duodenal biopsy followed by urease testing (presumptive), culture, and/or histologic staining. 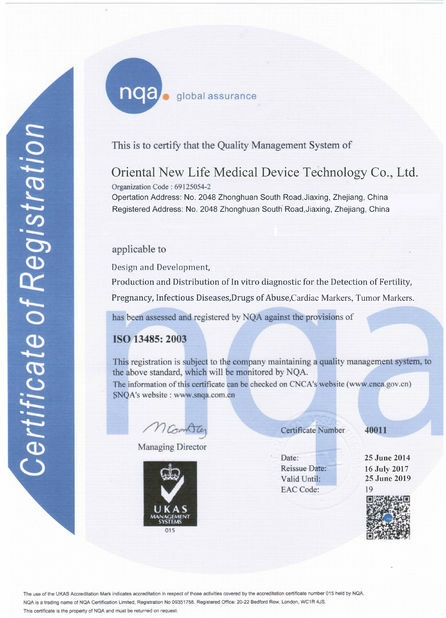 Non-invasive techniques include the urea breath test, which requires expensive laboratory equipment and moderate radiation exposure, and serological methods. Individuals infected with H. pylori develop antibodies which correlate strongly with histologically confirmed H. pylori infection. 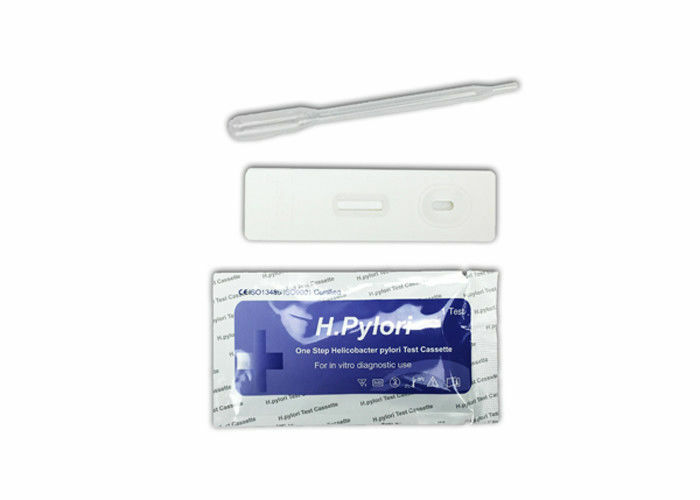 The H. pylori Rapid Test Device (Whole Blood/Serum/Plasma) is a simple test that utilizes a combination of H. Pylori antigen coated particles and anti-human IgG to qualitatively and selectively detect H. pylori antibodies in whole blood, serum, or plasma in just minutes. The H. pylori Rapid Test Device (Whole Blood/Serum/Plasma) is a qualitative membrane based immunoassay for the detection of H. pylori antibodies in whole blood, serum, or plasma. In this test procedure, anti-human IgG is immobilized in the test line region of the test. After specimen is added to the specimen well of the device, it reacts with H. pylori antigen coated particles in the test. This mixture migrates chromatographically along the length of the test and interacts with the immobilized anti-human IgG. If the specimen contains H. pylori antibodies, a colored line will appear in the test line region indicating a positive result. If the specimen does not contain H. pylori antibodies, a colored line will not appear in this region indicating a negative result. To serve as a procedural control, a colored line will always appear in the control line region, indicating that proper volume of specimen has been added and membrane wicking has occurred. 1. 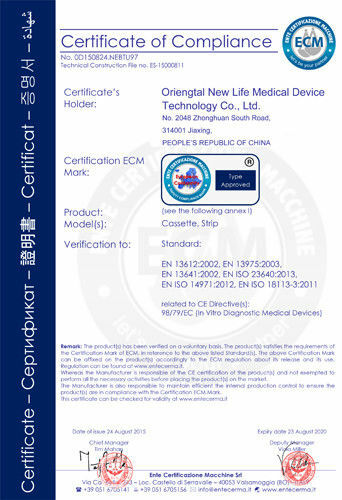 Bring the pouched test device to room temperature(15-30℃) prior to testing. Do not open the pouch until ready to begin testing. 2. Remove the device from the sealed pouch and lay it on a flat and dry surface. 3. Using the provided pipette, add one drop of fresh specimen to the sample well. 4. Hold the buffer bottle vertically and add 1 drop to the sample well. /If using a pipette, change a new one to avoid cross-contamination. Draw and transfer 2-3 drops of buffer to the sample well. 5. Read the result between 15-20minutes. Do not read results after 20 minutes. The H. pylori Rapid Test Device (Whole Blood/Serum/Plasma) has been evaluated with specimens obtained from a population of symptomatic and asymptomatic individuals who presented for endoscopic examination. Culture and/or Histology of biopsy specimens served as the reference method. Of the 321 fresh clinical samples collected, 136 were considered biopsy positive and 185 clinical specimens were considered biopsy negative. Biopsy “positive” was defined as either or both culture and histology are positive and biopsy “negative” was defined as both culture and histology negative. The results for each sample matrix are summarized below.